It was Aug 21, 1983 when Ninoy Aquino died and I was in my kindy at that time when the cortege passed by near where I live. I witnessed the vigorous pandemonium of crowd marching along España. I wasn't fully aware who was Ninoy then. All I knew was he had a very significant role in politics. I later found out that Ferdinand Marcos was accused of his assassination. I grew up admiring Ferdinand Marcos because of his undeniable brilliance. A great man inspite of his very dirty political history. A few years after Ninoy's death, Marcos was ousted as President of the Philippines. People power by millions of Filipinos in February 25, 1986 changed the landscape of Philippine government. From a dictator leader to a democratic one. 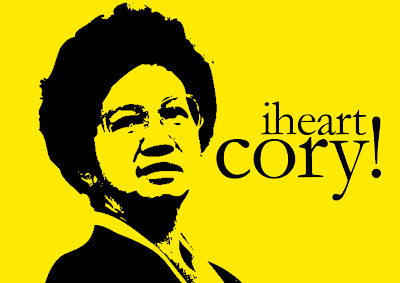 It was Cory Aquino who continued the legacy of her husband Ninoy. The very first woman president of our republic. A very God-fearing individual, a nurturing person and the symbol of democracy. She had her six year term from 1986-1992 as our president who served her country without any corruption and survived six coup d'état. In Aug 1, 2009 she died after struggling from her Cancer of the colon. Being away from my country I only rely news from the internet and the news I can get from my sister who is working in the Archdiocese of Manila. I always watch youtube and the updates from online newspapers. All of a sudden I saw how history repeats itself. I saw how the entire archipelago mourns and how Philippine flag turned into yellow. The love of millions of Filipinos to our Democracy Icon were over flowing. I never cared about Philippine politics and to prove that I remember one instance when I had a lunch with Rex Lopez & Bob Guerrero at Cafe Breton sometime last year. They were trying to challenge me with some dares. They were asking me to choose based on the two extreme options that they provided. They asked me which one you will choose: A. Have a one year cooking lesson with Jamie Oliver or B. Save Filipinos from having a chaotic country. Undoubtedly I chose A. Have a cooking lesson with Jamie for a year in exchange of having a systematic country. I never gave a damn care with my country. I feel that it's hopeless because we are already in the brink of orderliness extinction. A lot of things are unfixable. Today I ponder that I was wrong. Seeing the videos of Cory's burial in Manila Memorial Park while the song "Bayan ko" was sung, I suddenly wept. First time in my life I got emotional about my country. I really felt that we lost a great model of purity in the Philippine government. It's a rare chance that we can see huge Filipino crowd convene without being paid like all the rallies we had in the past years. All of them sacrificed there time and made big efforts to demonstrate their mourn about losing one great icon in Philippine history. We all love Cory because she's the reason why we are enjoying our democracy now. "I hope that we all show our patriotism and nationalism not only when it's cool, easy and when everyone is doing it but also when it's hard, unglamorous, unfashionable, and unrecognized." While still updating myself about Cory's burial, I stumbled on a photo of a very interesting yet funny coincidence. 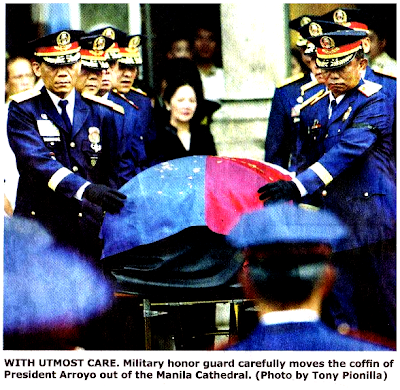 Is this an honest or intentional mistake by the writer who wrote the caption in Manila Bulletin newspaper? And by the way, Arroyo is the current President of the Philippines who is currently accused of plunder cases and the Filipino people want her oust. As I live my life, I often feel that I don't want to be a Filipino. But instances like this and seeing my country unites for a common goal still makes me proud to be a Filipino. And being here in Vietnam and working hard makes me feel proud that I am a FILIPINO in so many ways. Artist Chef is proud to be PINOY! Your post is very serious but the photo caption from Manila Bullettin, really, made me laugh! Hahaha! Thankyou for such a heartfelt post and interesting too. I hope you remain a proud Phillipina. That photo truly made me laugh out load dude! You are present in every cup of TEA! Always makes sense in everything that you do, and every blog that you post. I uber like you Ms. Artist Chef! Genial post and this post helped me alot in my college assignement. Gratefulness you for your information. artist-chef.blogspot.com; You saved my day again.